Hello my lovelies! Today has been a whirlwind, and my eats are definitely not worth even mentioning as they were all eaten in a rush between making much more interesting things in the kitchen. 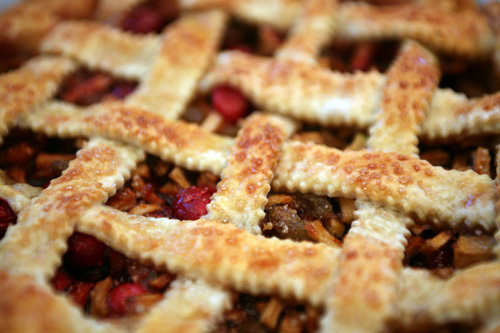 I'm rushing off to a holiday party tonight at my boss's house, for which I am bringing one of my favorite pie recipes. I thought I would share it with you this evening, and hope to post the other fun holiday treats that the hubb and I made today, tomorrow. Have a lovely evening! 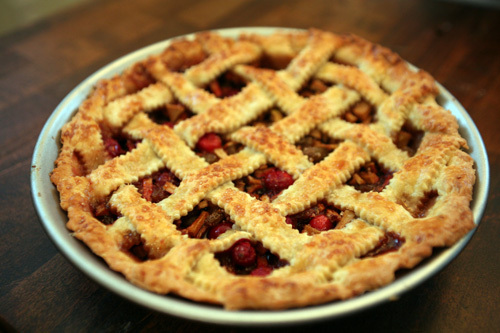 This is the first pie recipe I ever made on my own. I started with a recipe I found in an old cookbook of mine that I don't even have anymore, but have modified it over the years. 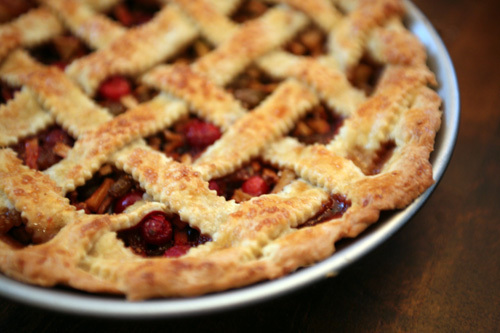 Its the perfect holiday pie and always a big hit. For the pastry, sift the flour and salt into a bowl. Add the butter and cut-in with a pastry blender or rub in with your fingers until the mixture resembles coarse bread crumbs. With a fork, stir in just enough iced water to bind the dough. Gather into two equal balls, wrap in parchment paper and refrigerate for at least 20 minutes. Combine orange zest and juice in a medium-sized bowl. Peel and core the apples and add them to the orange mixture. 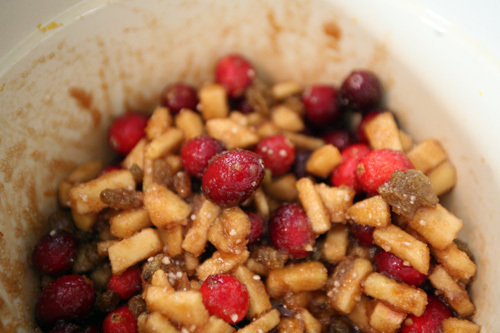 Stir in the cranberries, raisins, sugar and tapioca. On a lightly floured surface, roll out one ball of dough about 1/8 inch thick. Transfer to a 9 inch pie tin and trim the edge. 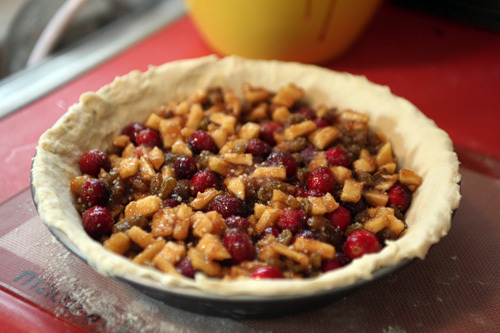 Spoon the cranberry apple mixture into the shell. 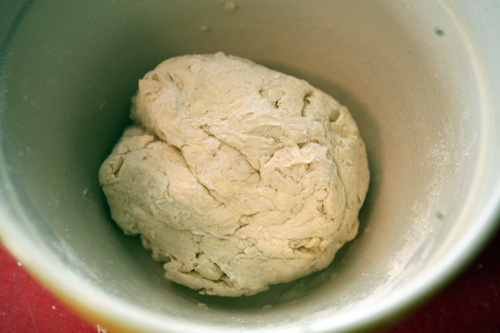 Roll out the remaining ball of dough to a circle about 11 inches in diameter. 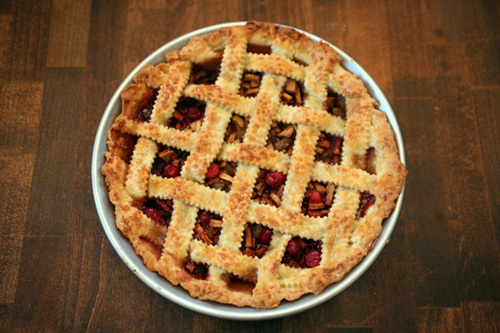 With a serrated pastry wheel, cut the dough into 10 strips 3/4” wide. 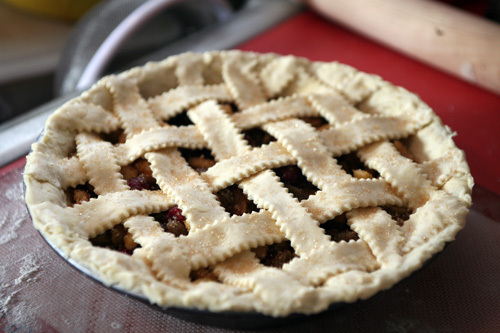 Lay five of the strips across the pie in one direction, and lace the other five strips perpendicularly to the first five. Brush the top of the dough strips with the egg wash and sprinkle with turbinado sugar. Bake for 45 minutes until the crust is golden and the filling is bubbling.